The first thing I heard of Brooke Sharkey was through a video of a house show on YouTube. She seemed to have turned that living room into a theater and had successfully enchanted her audience. No wonder I jumped at the opportunity to film a session when she was in Amsterdam earlier this year. Sharkey has released her second album Wandering Heart in the UK and it’ll be released on V2 Records in Europe later this month. It’s the follow up of her already stunning EP May (2012), debut LP One Dress (2012) and I Crossed The Line EP (2014). Her voice is like a perfect mixture of Julia Stone’s and Rachel Sermanni‘s. A rather spot on observation, for which I unfortunately have to give my girlfriend all the credits. Sharkey has the ability to draw you in and demand all of your attention, just through the dynamics of her singing; which sounds fragile yet extremely assured. 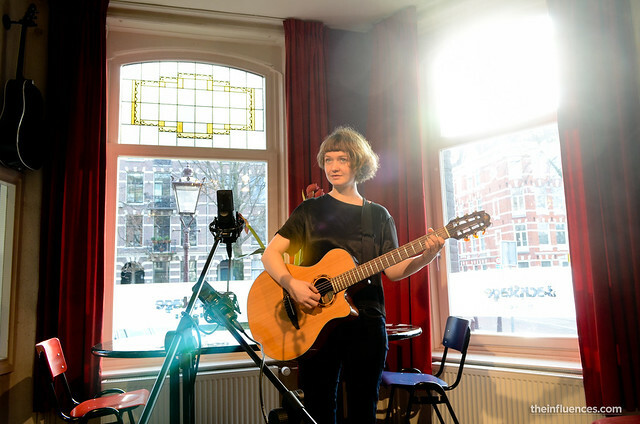 Last month, she was in Amsterdam to play a support show for Roald van Oosten – who’s got a session coming up soon on this website – so we met up the morning after and filmed a couple of songs at the Backstage Hotel. She treated us to some special covers of Tom Waits and Lhasa de Sela and a solo version of her own song Where To Go. Brooke Sharkey will be the support act for Thomas Dybdahl at Paradiso Amsterdam on April 25th, and before then, play a album release show in Utrecht at Eetcafe Stathe on March 18th. Click here for all tour dates, including Belgium, France and the United Kingdom.